Thank you for the kind comment, Daniel. Thank you for stopping in and viewing! Fantastic black-and-white with selective color~! I don't use selective coloring too often. For this print, it was taken with the vision of using selective coloring. Thanks for viewing. 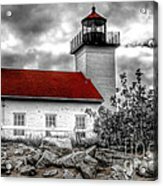 Thanks for viewing and the like, Rose-marie! I agree, it works well with this image. Thank you for the like and comment. Normally, I dislike using selective coloring. For this image I knew exactly how I wanted to process before I snapped the pic. I like it when things come together and I can envision and then make it happen. Thank you for the l/f. 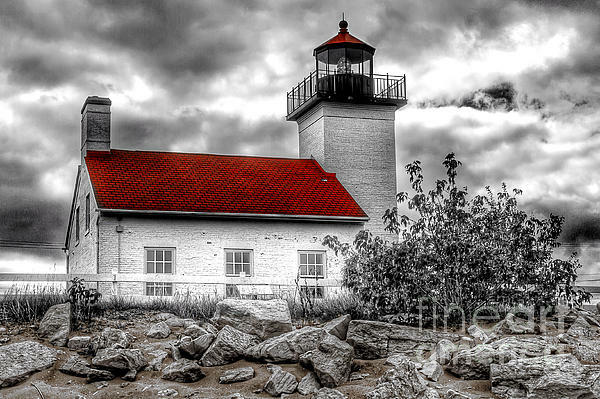 Pictured is the Sand Point Lighthouse on the Great Lakes in Escanaba, Michigan. 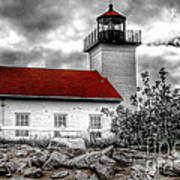 The lighthouse is a brick built building that has been protecting the Lake Michigan harbor since 1867.